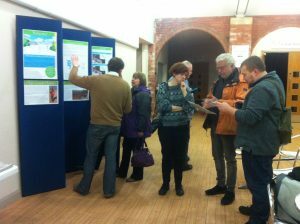 Thanks to everyone who came along to the ‘Our Green Homes’ exhibition on Wednesday. We’re busy looking through your feedback and noting your concerns, mainly around parking, access and infrastructure such as phone lines and water. We will be looking into these things and will come back to you over the next few weeks with suggestions. We will be adding all the information that was in the exhibition to the website. Thanks also for all the messages of support, good ideas and interest from many people at the exhibition. You can see Andy here (in the brown jumper) explaining part of the project to a visitor. We are happy to talk to you about any part of it – please keep telling us your thoughts and we will get back to you.